Despite a grim beginning to the season, members of the crab industry are holding out hope for high prices and a late fishery. The Alaska Board of Fisheries hasn’t yet decided whether to review harvest guidelines for Eastern Bering Sea Tanner crab and potentially open the season in January or earlier, or leave the fishery closed entirely for the next two years. Meanwhile, the Alaska Department of Fish and Game cut the quota for snow crab by 50 percent and for Bristol Bay red king crab by15 percent. Despite the cuts, crab industry stakeholders say the season for Bristol Bay red king crab is moving along at more than a healthy clip. “Some good news from the grounds, the crab look good. They’re heavy. There’s a lot of small crab, females. Folks are seeing pots just plugged with crab — so full they can’t get another one in,” said Jake Jacobsen, director of the Inter-Cooperative Exchange, a crab harvesting cooperative with 188 members that together harvest 70 percent of Alaska’s crab. Always a costly product, the sharply reduced Alaska crab quota will surely raise prices, though nobody will know by how much until the season wraps up and processors set prices. The average dockside price paid to fishermen for bairdi Tanner, snow crab, and Bristol Bay red king crab from 1985 to 2015 is $2.17, $1.37 and $5.08 per pound, respectively, and have been rising for snow and red king crab over the same timeline. Wholesale and retail rates climb higher. Jacobsen said, “we are looking forward to what will be record prices for king crab,” which would be more than the $10 per pound received in 2011. Tyson Fick, communications director for the Alaska Seafood Marketing Institute, said he expects prices to rise due to such a supply cut, but that he isn’t sure to what extent. Due to the lower quota, crabbers will have trouble making the fishery fiscally solvent. Even with a big spike in prices, the ex-vessel prices paid to crabbers won’t likely make up for the quota declines. However, Fick said the Alaska brand won’t suffer under the high prices justified by premium quality. Prices could fluctuate in response to foreign crab as well. Unlike the U.S., Russia increased its crab quota 20 percent to 30 percent for the 2017 season. The U.S. market not only still imports Russian crab, but much of the domestic product marketed in the U.S. as Alaska crab is in fact repackaged illegal, unreported or unregulated crab from Russian waters. Bristol Bay red king crab are one of a trio of main North Pacific crab stocks, and by far the most valuable on a per pound basis at the dock. Jacobsen’s puzzlement regarding the red king crab survey is a toned-down version of an ongoing dialogue about survey methods for opilio, or snow crab, and bairdi Tanner crab, the other two large crab stocks. Unlike red king crab, which has stayed at a fairly steady harvest level over the past half decade, snow crab harvests have varied wildly from year to year, from a height of 89 million pounds in the 2012 season to 40.6 million pounds last year and 20 million this year. Crab is jointly managed between the federal and Alaska governments. The National Oceanic and Atmospheric Administration, or NOAA, performs abundance surveys each summer before the winter crab fishery begins. The North Pacific Fishery Management Council, which oversees federal fisheries from three to 200 miles offshore, approves the over fishing limits and acceptable biological catches for each of six crab stocks based on the conclusions of the council’s Scientific and Statistical Committee, or SSC. The Alaska Department of Fish and Game then sets the total allowable catch, or TAC, and manages the fishery directly. It cannot set harvests above the limits established by the North Pacific council, but can and has set them lower than what has been approved by the SSC. This year, the federal survey looks screwy to the crabbers, particularly with the more geographically and biologically complex snow crab. Warming ocean temperatures and other factors could be creating a situation in which there could potentially be more crab to fish than allowed for by federal and state managers. “The question is, and the question we had across all of our stocks, was whether or not these extremely warm temps are affecting our abundance estimates,” explained Bob Foy, the laboratory director for the Alaska Fisheries Science Center in Kodiak, a research arm of NOAA. Temperature trends have gone up and down in the North Pacific. The fluctuation matches patterns in snow crab abundance. “We had the coldest year on record in 2012,” said Foy. “We had one of the warmest years on record in 2016. We’ve had steady warming between then, so the question is there any trend in all of our stocks? Snow crab survey sites straddle a border in the central Bering Sea near St. Matthew Island. The warmer water could be pushing the cold-loving crab north of the survey sites, leading to something like a false positive for declining abundance. Foy said he understands crabbers concerns about cuts in the face of what could be healthy abundance, but also said they probably aren’t missing much. Colder waters often produce crab smaller than the legal harvestable size anyway, and much of them are buried beneath ice sheets crabbers can’t get through. In the coming year, Foy said NOAA plans to study the issue more closely. Crabbers place some of the snow crab quota cuts at the feet of the federally-managed abundance estimates, but with Tanner crab they take issue with the state. Tanner crab was one of two stocks the National Oceanic and Atmospheric Administration charted as having a decline in biomass. In 2015, the biomass prediction for tanner crab was 163 million pounds. This year, surveys charted a drop down to a biomass of 100 million pounds. It is the female crab abundance that cancelled the fishery, rather than the overall biomass directly. According to the survey, there isn’t enough female crab in the sea for the Tanner crab fishery to open, despite the fact that the overall Bairdi stock itself is not overfished or experiencing overfishing, according to federal definitions. This is a marked departure form last year’s increased quota. In 2015, a total of 19.67 million pounds of Tanner crab was harvested, compared to 15.1 million pounds in 2014. However, the crab industry thinks ADFG’s harvest policy is an outdated holdover from a stock rebuilding program that is no longer relevant. 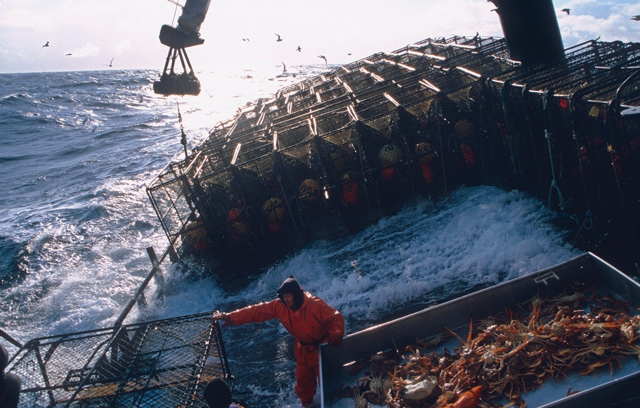 In a Sept. 8 emergency petition to the Alaska Board of Fisheries, industry stakeholders requested that the board revisit the harvest policy so the Tanner crab fishery can open. Unalaska Mayor Shirley Marquardt, St. Paul Mayor Simeon Swetzof, and Alaska Bering Sea Crabbers science advisor Ruth Christiansen signed the petition. Among other proposed changes to the harvest policy, stakeholders argue that the Tanner crab fishery is the only crab stock tied to the biomass of mature females, while the other stocks chart a combination of male and female. “A female-only threshold makes little sense for commercial fisheries specifically designed and executed to harvest only mature male crab,” the petition states. Further, stakeholders think the survey results themselves do not accurately reflect biomass, as static survey results taken during the warm summer months do not match the winter-driven catches of the mobile crab fleet, which has seen a rising amount of Tanner crab per pot in recent years. ADFG Commissioner Sam Cotten denied the petition, saying the situation does not meet the criteria for an emergency, which requires a conservation concern. An emergency criteria can also be met if a harvestable surplus will go uncaught because of a regulation, such as the state strategy for Tanner crab. Christiansen sent a second letter directly to Alaska Board of Fisheries Executive Director Glenn Haight with another emergency request, appealing Cotten’s decision. If two board members agree to take up the matter at the next board meeting in October, and if it decides to grant the petition, the Tanner crab fishery could potentially open late. If not, the fishery will stay closed for the next two years. Crab stock has to meet the minimum threshold for two consecutive years before managers can open the fishery again. Crab industry stakeholders requested ADFG rewrite the harvest plan, but without a conservation concern ADFG commissioner Sam Cotten denied the request. In an appeal, the crabbers wrote a second emergency request directly to the Alaska Board of Fisheries, asking the board revamp the plan. “There is some hope still that there could be a fishery, a curtailed fishery, for bairdi (Tanner) crab,” Fick said. That hope, however, hasn’t come to life just yet. Haight, the executive director of the Board of Fisheries, said board members haven’t moved on the issue. Depending on the board’s will, it could call an emergency meeting or potentially take up the issue at a regular board meeting. Aside from an Oct. 18-20 work session in Soldotna, the board will hold its next meetings Nov. 30-Dec. 3 and again Jan. 10-13 to discuss Lower Cook Inlet and Kodiak finfish, respectively. Jacobsen still has faith in a late season opener, though he hasn’t heard anything definite yet. Swings are the norm in Alaska crab fisheries, and he’s learned to roll with the waves.